A junction box is a box used only for connecting wires together. Junction boxes must be located in such a way that they're accessible later. i.e. not buried under plaster. Excessive use of junction boxes is often a sign of sloppy installation, and inspectors may get nasty. A junction box is a metal or plastic box in the middle or at the end of a conduit run. In order to meet excellent quality standards, we are supplying Junction Box Enclosure. In order to retain remarkable position in this industry, we are providing a wide array of Junction Box. is a full service designer, manufacturer and supplier of injection molded plastic enclosures, handheld electronic enclosures, instrument cases and anodized extruded aluminum enclosures. We produce a complete line of off-the-shelf injection molded enclosures, semi-custom and custom hand-held enclosures and cases. We offer Metal Junction Box Enclosure to our clients. 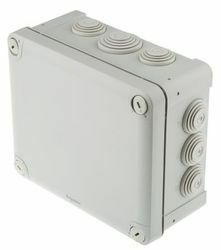 Our reputed entity is engaged in supplying Metal Junction Box Enclosures. 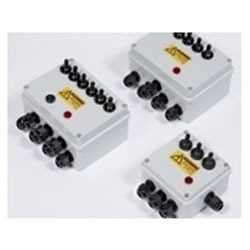 We are engaged in offering Junction Boxes ( Small Enclosure Fab ).